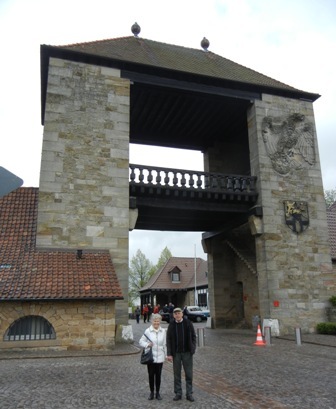 My parents came to see me when I was in Karlsruhe for a business meeting a couple of weeks ago. They took me for a drive around the southern Pfalz region, which is a major wine producing area in Germany. It was a beautiful day in spring with mild temperatures and fast moving clouds. After a short rain, the sun came out for a while. 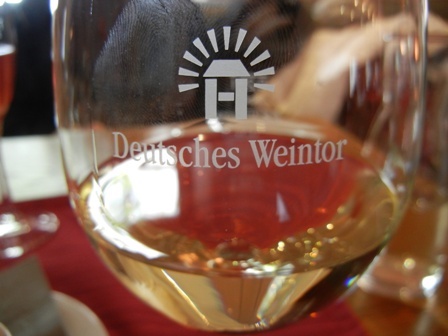 We ended up at a small village called Schweigen-Rechtenbach to have a look at the German “Weintor”, literally translated as the “German wine gate”. It was built in 1936 and marks the starts of the German wine route which ends in about 85 km further north in a village called Bockenheim. 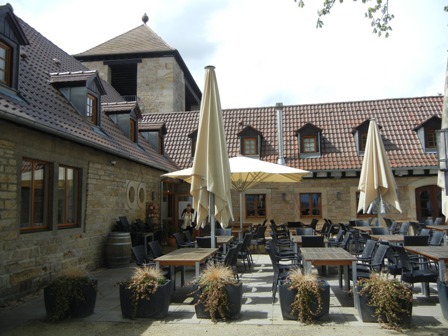 We planned to have lunch in the restaurant at the “Weintor”. The large terrace was very inviting but it was still too cold to sit outside. The stone building looks very traditional from the outside. 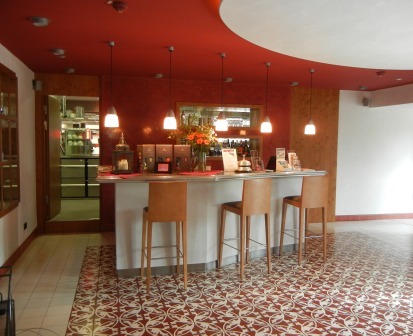 However, the foyer of the restaurant has a kind of post-modern funky look, “retro” one could also call it. We sat near the fire place. 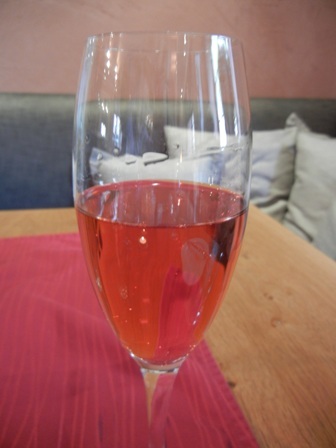 The staff was very friendly, and convinced us to get started with a sparkling Pinot Meunier, or in German “Schwarzriesling”. 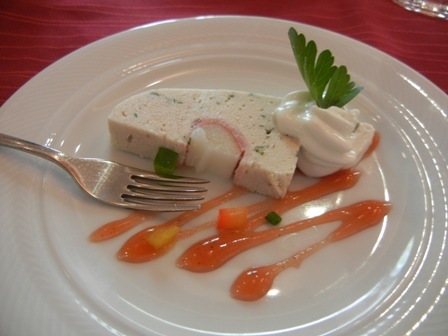 This was followed by “greetings from the cook”: a delicious pate, which was just the right starter. It wetted our appetite. I could not resist and ordered the house Riesling, a dry wine from the Pfalz region. 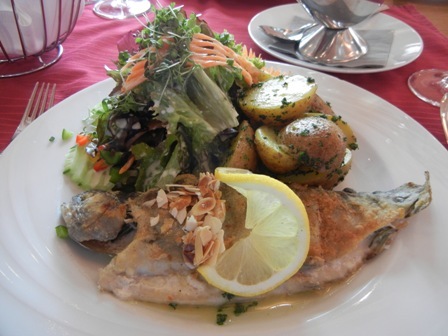 My main dish was a trout with almonds, with potatoes and salad. Just wonderfully delicious. It was the right hearty meal which made me forget my jet-lag. I had arrived the very same morning from Bangkok and needed some stimulation to stay awake. 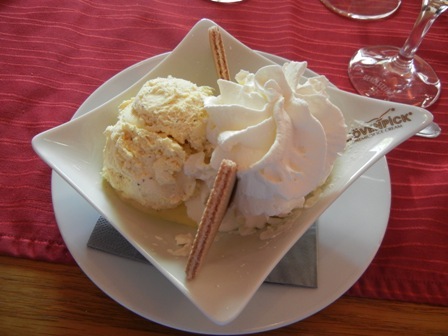 That’s why I could not resist the ice cream either. We had a jolly good time. 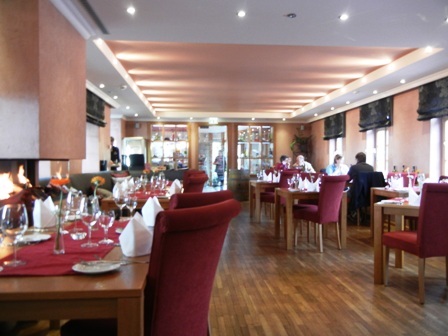 The food was delicious, the staff extremely friendly, the spring outside inspiring and the company just great. I could not imagine a better welcome to Germany. 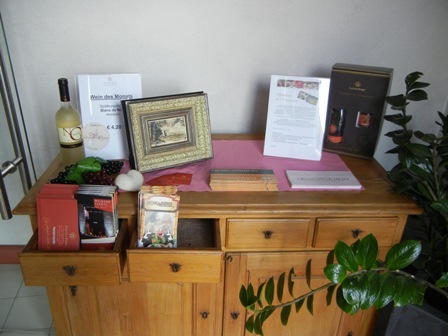 On our way out, I noticed the table with the informations about wine events and other local festivities. It was a pity that I could not stay a couple of days longer. The wine route through the Pfalz/Palatinate has so much to offer. When I attended the party convention of the German Free Democratic Party (FDP) in Karlsruhe a couple of week ago, I was not so sure that I would have the time for some wine tasting. Alas, the Saturday night party of the FDP showed that there was no reason to worry. Karlsruhe is located on the right side of the Rhine river in Baden, one of the smaller German wine regions in the South-west, just across the Rhine river from another famous German wine region: the Pfalz (Palatinate). It goes without saying that wine from Baden was the choice of the organizers, and a good choice it was. 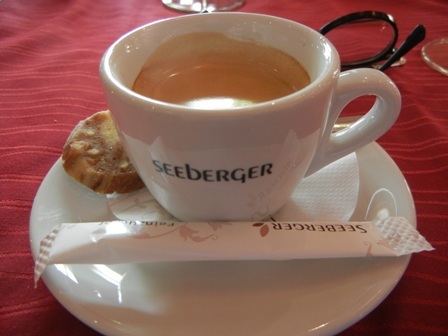 One does not expect a “grand cru” to be served at such an occasion. After an excruciating day of debate and discussion the hundreds of party delegates just want to get on with their lives. However, a decent drop of wine is very much appreciated. 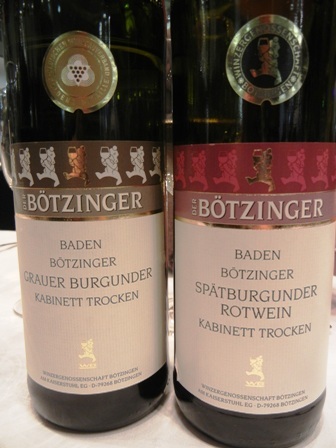 Two wines were on offer, a ‘2011 Boetzinger Pinot Gris, Kabinett dry’ and a ‘2011 Boetzinger Pinot Noir, Kabinett dry’, both in their dry variant. 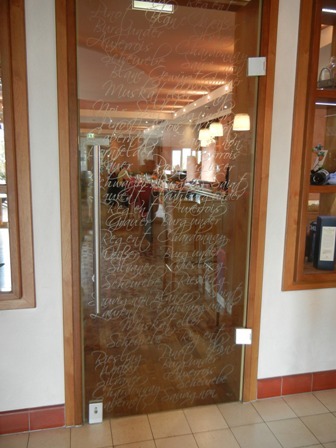 Boetzinger is a wine co-operative, the oldest wine co-operative at the Kaiserstuhl in Baden. It has about 500 vintner members who produce first quality grapes. We started with the white and followed through with the red, both wines were very pleasant, clean and crisp for easy drinking and dry: in short excellent specimen of their kind. We drank lots. The waiters kept bringing the stuff. When we got up at about two o’clock in the morning we had a good fill. And the next morning, you might ask? Well, just fine. The wine not only had a decent taste, it showed its quality also after a huge consumption. From the Boetzinger website I found that the bottle of Pinot Gris costs only EURO 5.75 and the bottle of Pinot Noir is EURO 6.30, both very decent prices especially when you are dealing with the exorbitant wine prices here in Thailand. Try the wines of Boetzinger.